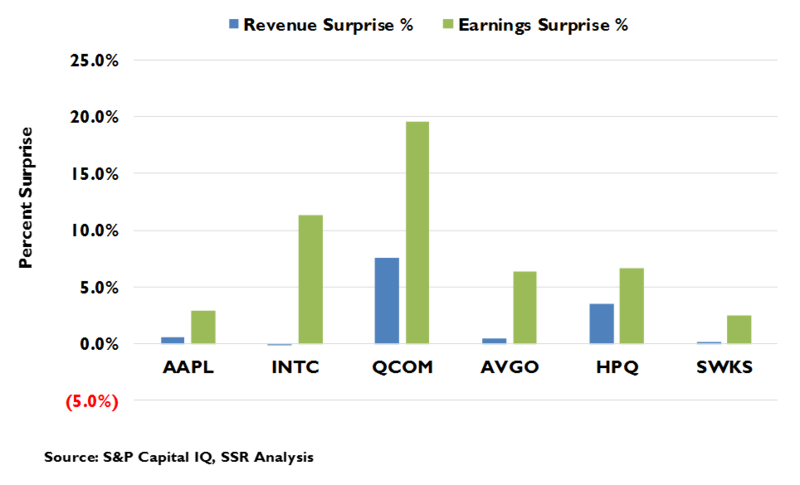 2Q16 earnings season played out with just a few surprises. AMZN, GOOGL, and FB all easily topped consensus on strong, accelerating sales in e-tail, cloud hosting, and digital ads. In contrast, NFLX and TWTR continued to sputter subs/sales concerns, although M&A talk buoyed TWTR. MSFT returned to growth ahead of expectations on the heels of its bold $26B deal for LNKD. The larger SaaS names posted excellent numbers all around. Most traditional IT stocks rallied on sales that didn’t decline quite as much as the dampened projections – we are still concerned. The same is true for AAPL and its suppliers – there is a lot riding on the possibly pedestrian iPhone 7 launch – with QCOM an exception as it ramps royalty collections in China. The big media names lost a bit of their 1H16 swagger, as fears returned for the future of linear TV – we see disappointment looming for 2017. Disruption continues in the wireless market – VZ and T are slow bleeding, S is showing life while underinvesting, and TMUS is twisting the knife with a new unlimited data plan. 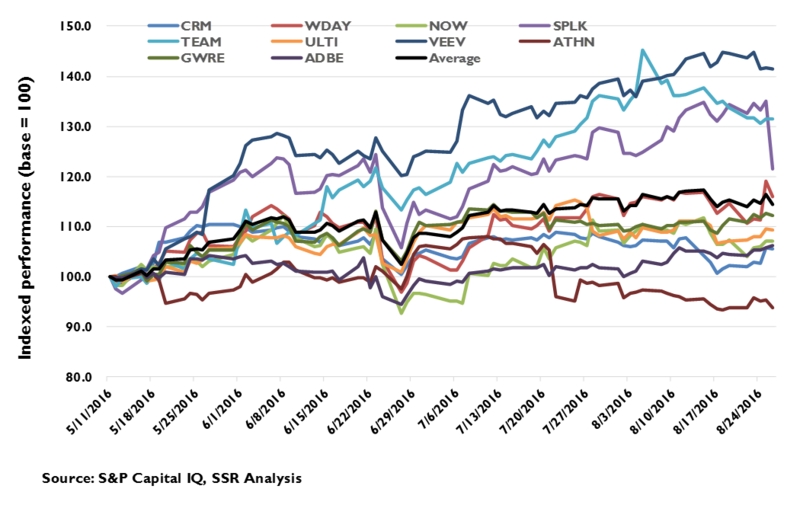 Our 15 stock TMT model portfolio outperformed large cap tech by 200bp over 3 months. We are replacing LNKD with NVDA. Device stocks bounce against soft expectations – Device stocks – e.g. AAPL, HPQ, QCOM, AVGO, etc. – staged a strong comeback in the quarter, despite continued weakness in overall demand for smartphones and PCs. With the exception of QCOM, which showed meaningful improvement in its ability to collect royalties in China, upside surprises in the group were more a function of reduced estimates than in accelerating performance. We are particularly skeptical of the enthusiasm for AAPL, which faces deteriorating competitive position in China and the potential for a lackluster launch for the upcoming iPhone 7. AMZN, GOOGL and FB are all killing it. AMZN crushed expectations on continued torrid AWS growth and big upside in its core e-tail operations. GOOGL sales growth accelerated on strong mobile and video ad sales, quieting skeptics looking for signs of erosion in the search franchise. Likewise, FB’s sales blew past forecasts, accelerating 200bp to an astounding 59% YoY growth. We believe that all three have massive structural advantages in the generational TMT paradigm shift to the cloud that is underway and believe that long term expectations for the trio are very likely conservative. Sub growth slowed for fellow FANG NFLX, perhaps owing to price increases, but we are cautiously optimistic that new content will re-ignite growth. We note that TWTR has appreciated strongly out of disappointing 2Q16 results, almost certainly on take-out speculation. MSFT leading the transformation of enterprise IT. MSFT surprisingly returned to growth despite the continued overhang from declines in the PC and Windows Phone markets. Azure sales growth almost doubled AWS, gaining ground on the IaaS leader, while Office 365 and other cloud initiatives continued apace. With its cloud and AI strength serving a bold transformative strategy, we see MSFT as the big long time winner in the enterprise. Other traditional IT players – e.g. IBM, HPE, CSCO, etc. – are posting declining sales, and rallying only by beating even weaker forecasts. The group have been stalwarts for value investors, but we believe that their already poor revenue trajectories will only weaken. SaaS back on track. We recently highlighted the strong likelihood of acquisitions from the universe of SaaS application stocks. For investors, this potential is reinforced by the broadly excellent results posted by the group in 2Q16. 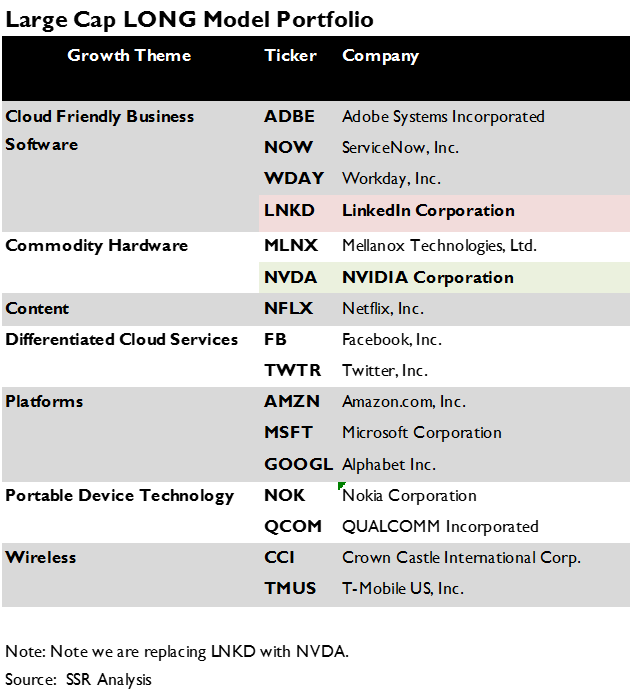 We hold WDAY, NOW, LNKD, and ADBE in our model portfolio and all delivered strong performance for the past quarter. The TV party may be over. After a big 1H16 media stock rally, four of the big 6 TV network companies ran into tough sledding with their 2Q numbers. TWX bucked the trend with an EPS beat and an investment in Hulu outweighing a YoY sales decline. 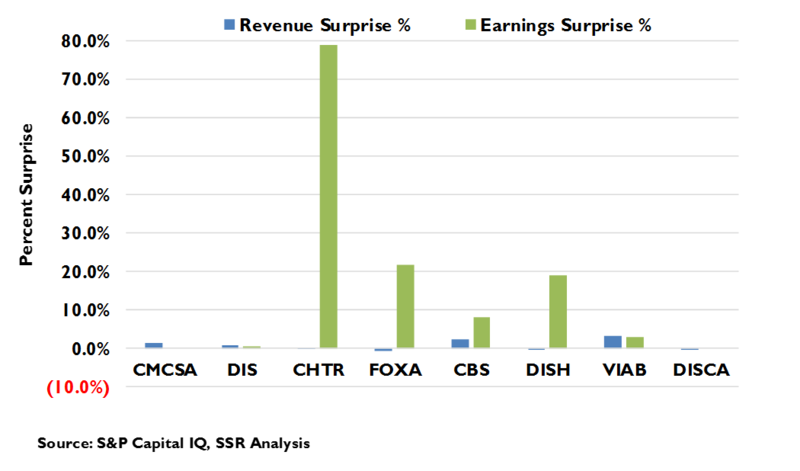 CMCSA also performed will on the quarter, largely due to surprisingly excellent pay TV sub numbers. With a disappointing Olympics behind us, and signs that the upcoming campaign may not be the expected bonanza, investors may already be looking ahead to what may be a very difficult 2017 for the group. S joins TMUS in assault on VZ/T. TMUS and S both delivered sub gains, upside surprises and double digit appreciation out of their earnings reports, while VZ and T disappointed. The recent announcement that the number 3 and 4 US wireless carriers will bring back unlimited data plans will likely raise the heat on the market leading duopolists. We look for TMUS to be the biggest buyer of spectrum in the ongoing FCC auctions, offering a pathway to capacity and coverage parity with VZ and T. In contrast, we are concerned that scaled back capex at S leaves them vulnerable to service deterioration in the wake of the shift to unlimited data. T and VZ – Dividend havens getting pricey. The two big US carriers are each up ~24% YTD, dropping T’s dividend yield below 4.5% and VZ’s to just over 4%. Analysts expect T to deliver about 2% organic growth (after DTV) while VZ sales are projected down by less than 1%. We expect both to report declining post-paid phone subs going forward, with low revenue car and tablet subs generating all of the unit growth. ARPU will be a key number – both carriers are choosing to ignore TMUS’s price provocation, so strong per sub revs are a must. We see ample reason to be concerned, but the results may not be scary enough yet to move the stocks. 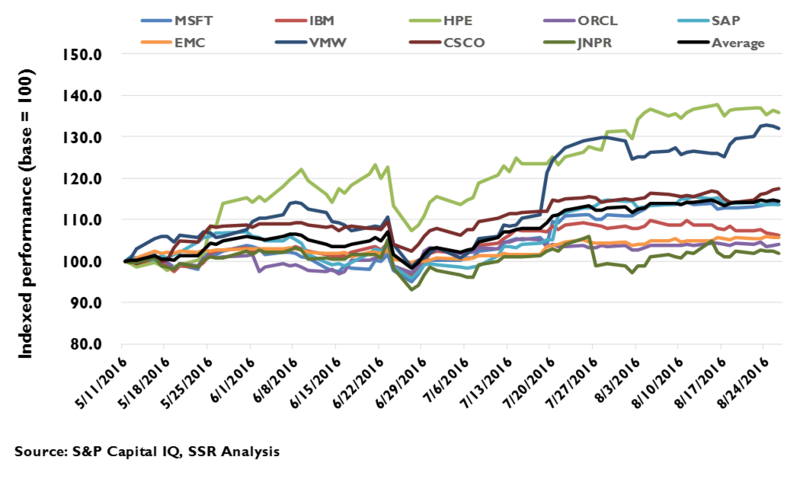 Our model portfolio outperformed by 250bp. 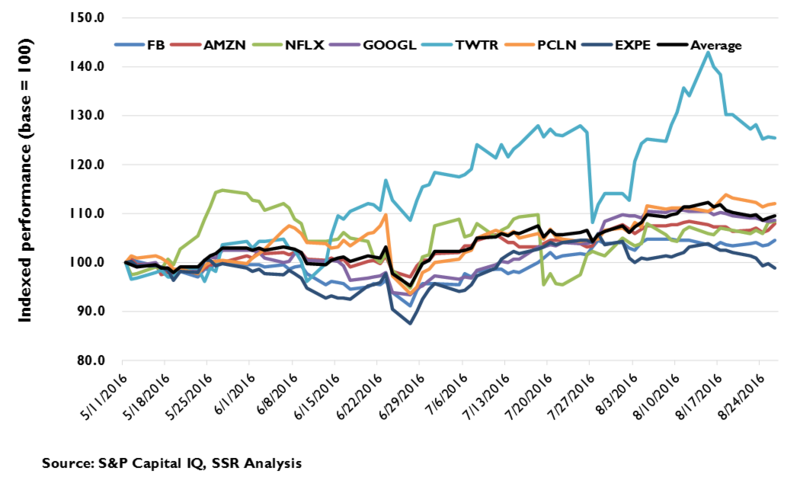 Our large cap model portfolio outperformed the S&P 500 by 850bp and the tech components of the index by 250bp. LNKD is up 49% on its deal with MSFT, TWTR and QCOM have both rebounded 20%+. MSFT, WDAY, TMUS, and NOK, also beat the benchmark. CCI, and MLNX were the only stocks to fall short of the S&P500, but both were up for the quarter. Replacing LNKD with NVDA – We are comfortable with our thematic focus on the ongoing paradigm shift to the cloud. While we have some concerns for slowing sub growth at NFLX and the soap opera that is TWTR, we remain convinced of both companies’ long term value. In contrast, we are more confident in the near term prospects for CCI, which could see tower demand peak in the next few years as wireless networks begin to de-emphasize traditional macro-cells. MSFT’s acquisition of LNKD prompts our only change this quarter. We replace it with NVDA, which we believe has considerable momentum in hyperscale data center and automotive applications. 1H16 saw a minor reversal of the trends established in 2015 for TMT stocks. The FANGs collectively lost their mojo, with Facebook the positive outlier and Netflix a negative one. Apple investors tried twice to stage a breakout rally. Media stocks surged, as campaign fueled ad spending distracted from shrinking audiences. Traditional IT names were rewarded for not declining as quickly as some had feared, while a pair of February misses (LinkedIn and Tableau) hammered the high multiple SaaS subsector. Dividend chasers took Verizon and AT&T higher, even as T-Mobile picked their pockets for market share. With 2Q16 earnings, sentiments began to reverse once again. Facebook, Amazon and Alphabet all posted fantastic numbers and began moving up, while fellow FANG Netflix still struggled with sub counts and took another step back. Apple “beat” with 15% YoY sales declines and started another attempt at a breakout in front of the September iPhone 7 reveal. TV media showed a few signs that the good times could be short lived and the stocks began to recede, with the exceptions of Viacom, which traded up on relief that its leadership soap opera might be nearing an end, and Comcast, which continued to buck the trend of Pay TV sub losses. 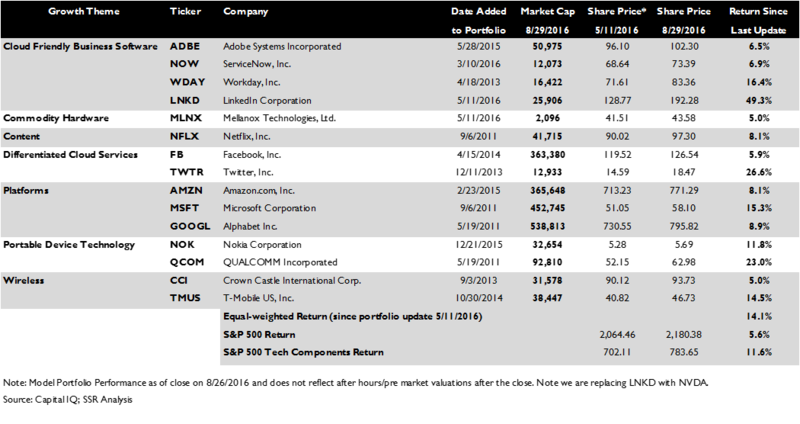 Microsoft is showing that it may deserve a spot in the Mount Rushmore of internet stocks – FAMG instead of FANG? – returning to growth with stellar cloud revenues. The SaaS sector told us that February was an anomaly, turning in almost universally strong 2Q16 results with torrid growth. Meanwhile, traditional IT stocks continue to defy gravity, continuing to top greatly reduced expectations but showing no signs that they will be able to grow long term. In telecom, Sprint joined T-Mobile in posting sub gains – we have a lot more confidence that T-Mobile can maintain the pace – and Verizon and AT&T were worse off for it. Internet stocks showed life in the quarter, particularly in their 2Q16 reports. Surprisingly, Twitter, which delivered another dismal quarter of decelerating ad sales, has been the top performer in the group – all on speculation that management may be ready to talk deal in the wake of Microsoft’s $26B takeout of LinkedIn. This is not entirely farfetched, although we see regulatory interference with the two combinations that make the most sense – Facebook or Google. We continue to see Twitter as a unique and valuable service that has been poorly marketed and badly mismanaged (Exhibits 1-3). Facebook, Amazon and Alphabet all posted stellar numbers, with Amazon gaining the most for it. We see all three as bedrock pieces in any TMT portfolio. Netflix, once again, disappointed on its subscriber counts and dragged out of earnings. Recently, some cheerleading from brokerages renewed investor interest – we believe enthusiastic reviews of new programs and the annual back-to-school viewership bump could deliver some needed subs momentum for 3Q16. We have been negative on the travel group, seeing long term margin pressures ahead. Expedia hit some bumps in the road as it handles the integration of acquisitions, but Priceline continues strong performance even in the face of middling 2Q16 results. We acknowledge that our call was quite a bit too early, but continue to see issues for the group in years to come. In a quarter when global sales of PCs and premium smartphones were down year over year, OEM and device chip stocks are up an average of 20% since early May. Apple made its second run for 2016 after topping greatly reduced sales and earnings expectations, peaking up 18% at $109 a couple of weeks ago. Still, technicians have undoubtedly noted that Apple peaked higher in April (and of course higher still in late 2015. Some of the enthusiasm stems from conviction that October will bring the two-year echo of the massive iPhone 6 sales. We are not convinced. The loss of carrier subsidies, the shift of demand toward less developed economies, wide availability of gently used iPhones in the secondary market, and a lack of compelling product innovation may have significantly lengthened upgrade cycles. The long term downward glide path for global PC sales is even more widely accepted than the arguments for peak iPhone. Nonetheless, HPQ, gaining significant share in the declining market, posted PC sales growth that partly offset big declines in printing. Investors responded by taking it higher, despite cautious guidance for the rest of the year. Wall Street has historically had a difficult time with long term declining annuities, and with consensus expectations for flat earnings on declining sales, we are skeptical that the news flow will remain benign for much longer. Chip companies that supply to smartphone and PC OEMs have also enjoyed a strong run. Intel, Broadcom, Qualcomm and Skyworks have followed their device customers higher since May. Of these, Qualcomm, which finally showed movement in collecting royalties from Chinese OEMs, has the best reason for its move – we see potential to expand both licensing and chip revenues as the world continues its move from 2G to 3G, 4G and 5G. Broadcom, still being absorbed by Avago in its reverse merger, is getting excellent growth from its non-smartphone segments but will face down expectations for iPhone 7 growth in its October and January quarters. Skyworks is, perhaps, the most iPhone exposed supplier, and it is up 15% over the past 3 months in line with Apple. Given our view that iPhone 7 sales are likely to be disappointing, this leverage is a substantial risk (Exhibits 4-6). Given its powerful positions in cloud hosting and SaaS applications, Microsoft is separating itself from its longtime rivals, but given its comprehensive strategy to use the cloud and AI to remake enterprise productivity (http://www.ssrllc.com/publication/msft-an-ai-powered-vision-for-the-future-of-enterprise-computing/) it is worth contrasting it with these traditional competitors. Microsoft posted a well-received upside surprise in its fiscal 4th quarter, returning to growth ahead of schedule on torrid cloud growth, including a doubling of its Azure IaaS cloud hosting business. We believe that Satya Nadella has the company positioned to play with Amazon, Google and Facebook as one of the elite players leading a generational shift into the cloud/AI era. The rest of the group? Not so much. 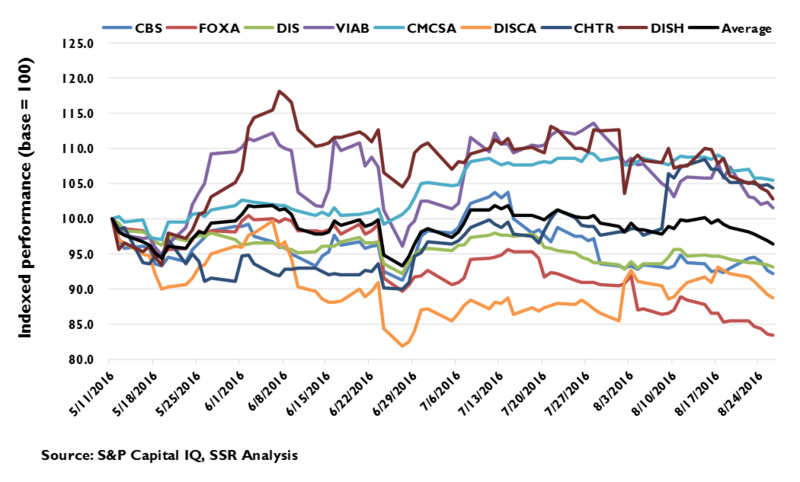 Still, traditional IT has made a tremendous run YTD, a real echo of the outperformance delivered in 2014. Again, we see this as a reflection of adjustments to expectations rather than any meaningful change to the long term prospects for the companies. Stocks like Cisco, Hewlett Packard Enterprise, IBM, Oracle, and SAP have seen P/Es rise into the mid-teens on expectations of earnings acceleration without signs of top-line improvement. We would be extremely cautious with this group (Exhibits 7-9). We wrote about the SaaS application space and the potential for M&A at length in a recently published note (http://www.ssrllc.com/publication/saas-applications-cloudy-with-a-chance-of-ma/). This group suffered a sharp devaluation in February in the aftermath of simultaneous disappointments from Tableau and LinkedIn. Since then, results have been stellar, including nearly across the board beats for 2Q16. Share prices have recovered back to pre-February levels, but remain a bit depressed on a multiple basis given the exceptional sales growth happening in the sector. Our model portfolio has been heavily weighted toward SaaS, with 5 of the 15 constituents focused on offering enterprise applications as a service, including Microsoft. We believe that SaaS applications will become the dominant enterprise computing paradigm over time, driving substantial further long term growth and synergistic consolidation that will greatly benefit shareholders (Exhibits 10-12). Of the six subsectors that we are highlighting in this report, Media is the only one that has traded down over the past 3 months. A narrative of TV advertising resilience, with strong campaign spending and good pricing in the scatter market, has been shaken by weak viewership, including for the recent Olympics, and by shrinking PayTV subscriber counts. 2017, without a campaign or an Olympics to buttress ad sales, looks like a very tough environment for traditional media (Exhibit 13-15). Interestingly, Viacom, with its vulnerable demographics and boardroom soap opera, has moved from laughingstock to group leader, buoyed by value seekers hoping that the worst is behind it. Charter, with potential synergies from its Time Warner Cable combination, and Dish were the other two to show appreciation in the quarter, albeit still lagging behind the S&P500. 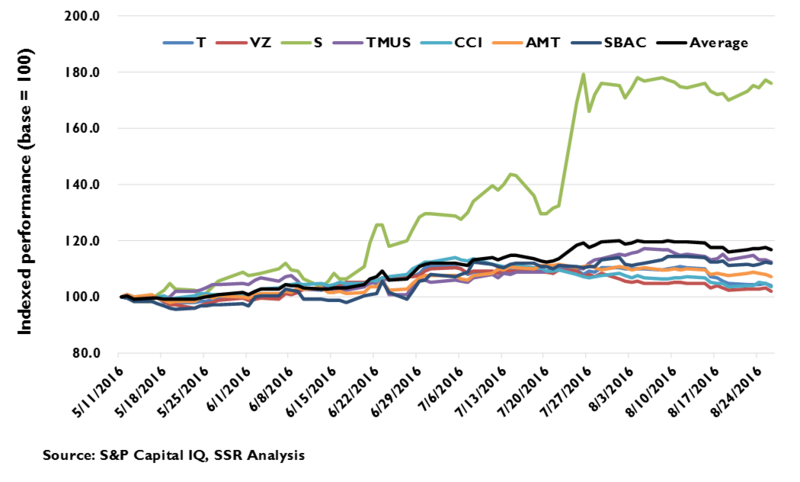 Everyone else, including erstwhile investor favorites CBS and Disney, underperformed dramatically. We don’t see this getting much better. Despite concerns for subscriber counts, signs point toward Netflix taking an ever larger share of its subscribers’ viewing hours with acclaimed new original content arriving every month. Similarly, Alphabet’s YouTube continues to post extraordinary growth in streaming hours. Add in Amazon’s fast growing Prime Video and a resurgent Hulu, and competition for consumer audiences is fierce. Cable, telco and satellite Pay TV subscribership is falling at an accelerating rate – projections of a slow bleed look considerably optimistic. Verizon and AT&T went on a run to start the year, attracting investors to their apparently stable growth and big dividends. However, for the past 3 months, they have been the laggards of the telecom group. In 2Q16, both of the leaders lost post-paid wireless phone subscribers, as the relentless competition from T-Mobile and, to a lesser extent, Sprint eroded their customer bases. Unfortunately, those giant dividend yields make it difficult for the big two to compete on price. Surprisingly, Sprint was the big winner of earning season, posting net sub gains vs. all three of its major competitors for the first time in more than 5 years. Investors took the stock up 27% on the day of the report, and shares sit nearly 80% higher now than they were 14 weeks ago. While the previous narrative, which had some analysts offering predictions of bankruptcy, seemed unnecessarily gloomy, the new one, which sees Sprint sustaining its newfound momentum and joining T-Mobile as a challenger to the hegemony of the VZ/T duopoly, might have us a bit ahead ourselves. Sprint’s debt load and commitment to a capex-light network strategy in the face of taking up T-Mobile’s unlimited data challenge carries a lot of risk. We would much rather own T-Mobile shares. The number 3 US wireless carrier posted market leading subscriber gains and beat consensus on both revenues and earnings for the quarter. Strong momentum on cash flows has prompted analyst upgrades, and given its double digit sales growth trajectory and demonstrated leverage to the bottom line, we see potential for future upside surprise. The tower stocks also had a nice quarter, with our portfolio constituent Crown Castle the only one of the three to underperform the S&P 500, and then only by less than a percent. The group is expected to decelerate top line in 2017, but we see some upside as planning to build out in the new spectrum now being auctioned should drive incremental demand. Longer term, we have some concerns that 5G architecture will deemphasize tower based macro cells in favor of small cells, but we see those impacts as more than 2 years away (Exhibits 16-18). 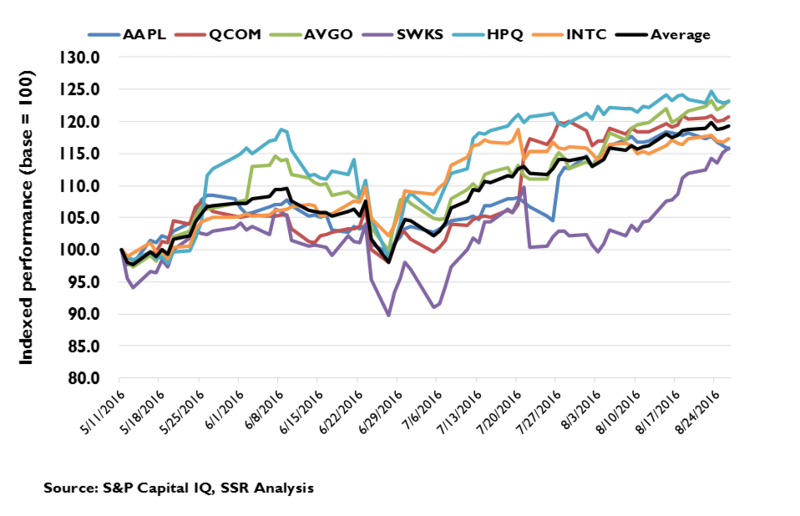 Over the past 14 weeks, our model portfolio outperformed the S&P 500 by 850bp and the tech constituents of the index by 250bp. The biggest contributor was LinkedIn, which surged 49% on Microsoft’s announced takeover. Twitter, T-Mobile, Workday, Nokia, Qualcomm and Microsoft itself all appreciated by double digits, while Mellanox, Crown Castle and Facebook were the laggards, with less than 5% increases. We are comfortable with the general construction of the portfolio, with its emphasis on the big cloud franchises (Alphabet, Amazon, Facebook and Microsoft) and SaaS Applications (Adobe, Workday, Service Now and LinkedIn). Given Microsoft’s acquisition of LinkedIn, we are removing it and adding GPU chipmaker Nvidia. While we continue to advocate a strong weighting toward SaaS, we had devoted a full 33% of our model portfolio to the category (including Microsoft). Nvidia serves the cloud in a different way as a key supplier to IaaS hyperscale data centers, providing specialized processing for AI applications for both Amazon and Microsoft. It is also well-positioned for the automotive market, as AI-based autonomous driving capabilities become more widely deployed.